This meeting to discuss the implications of Tidemill Primary becoming an Academy School is now to be chaired by Joan Ruddock MP. How much was Mark Elms paid? I am grateful for a comment posted from a local resident who has signed the parent petition but is concerned that the facts about Mark Elms' pay need to be correct. At the time his pay hit the headlines in July, I didn't make many public comments about the issue - precisely because the facts were unclear. However, now that the school is the one school in Lewisham to have rushed ahead with plans to become an Academy, it is inevitable that people are linking the two issues - and my comment has clearly been picked up this time! The issues over the Head's pay are separate to those over the Academy - but these questions will be raised by parents and teachers. After all, in the conversations that I have had with governors in other London schools considering becoming an Academy, the only real argument that has been raised is that they might get more funding (at the expense of other schools and the Local Authority budget of course). So my original question remains, "does the school really need to grab even more money if it can afford to pay a primary head that much?" The quoted "out-of-hours" payment has angered local teachers who do lots of unpaid overtime every year too. The decision to pay the City Challenge money also needs explanation as, in my understanding, when a head is "providing services to another school", the money should go from one school bank account to the other school's bank account as a payment to the school for those services. If the figures are correct, I am unclear why the governing body decided to then make those payments to Mark Elms rather than use the funds to, for example, employ other staff and resources to cover for his absence. I am happy to update the information to be as accurate as possible - if anyone can provide definitive answers! Postscript: Martin Powell-Davies (Secretary, Lewisham NUT) has since written more on his blog about this subject. See his letter to the Tidemill governors here. The Bird's Nest applied for a variation in their license for live music and the serving of alcohol – to extend alcohol sales by one hour on a Thursday to midnight and by one hour on Friday and Saturday to 2am, and to extend live music provision by two hours on a Thursday and Friday to midnight and on Sunday to start at 2pm. At the License Committee meeting on August 18th, a Frankham House resident was present to object, backed up by a Environmental Health Enforcement Officer's presentation of numerous complaints from residents. 1. Internal lobby with both sets of doors to be kept closed during live music except for entry and egress. The variation of the licence was not granted for the application relating to the sale of alcohol. 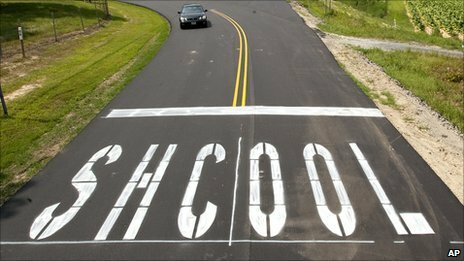 The Government’s plans to encourage ‘outstanding’ schools to take a fast-track to ‘Academy’ status are a threat to the future of comprehensive Local Authority schooling. They could introduce a fragmented two-tier education system where ‘successful’ schools opt-out of the Local Authority, taking money with them as they go, leaving cash-starved Councils with the schools - and pupils - that need most help. Fortunately, may schools have held back from rushing into becoming Academies in September – but not all. In Lewisham, it is TIDEMILL SCHOOL IN DEPTFORD that is rushing onwards – yes, that’s the same school that hit the headlines when it was revealed that its Headteacher, Mark Elms, was paid over £ ¼ million in 2009/10 (does the school really need to grab even more money if it can afford to pay a primary head that much?). Under pressure, the Government has conceded that parents should be consulted over plans to become an Academy – but Tidemill’s timetable shows how limited that ‘consultation’ can be. As last term drew to a close, Tidemill children were handed a letter for parents on July 19th saying that the governors were consulting for two months (i.e. over the summer holidays) before governors make a decision early in September! BUT SOME PARENTS HAVE NOT BEEN PREPARED TO ACCEPT THIS SHAM CONSULTATION – NOW THEIR CAMPAIGN URGENTLY NEEDS YOUR HELP! 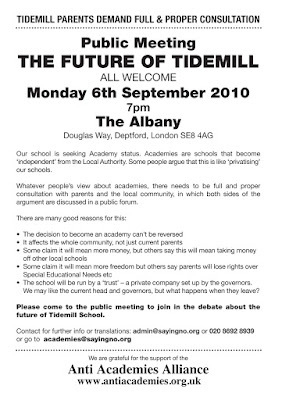 Tidemill parents made sure leaflets opposing the plan were given out at the school gates before the end of term. An inaugural meeting of “Tidemill Parents Against Academies” was held over the summer and, with the support of the NUT and Anti-Academies Alliance, leafleting has already taken place in Deptford with a lot of support from local residents and parents. Local councillors are now beginning to ask questions – but time is tight to put enough pressure on the governors to hold back. 1. 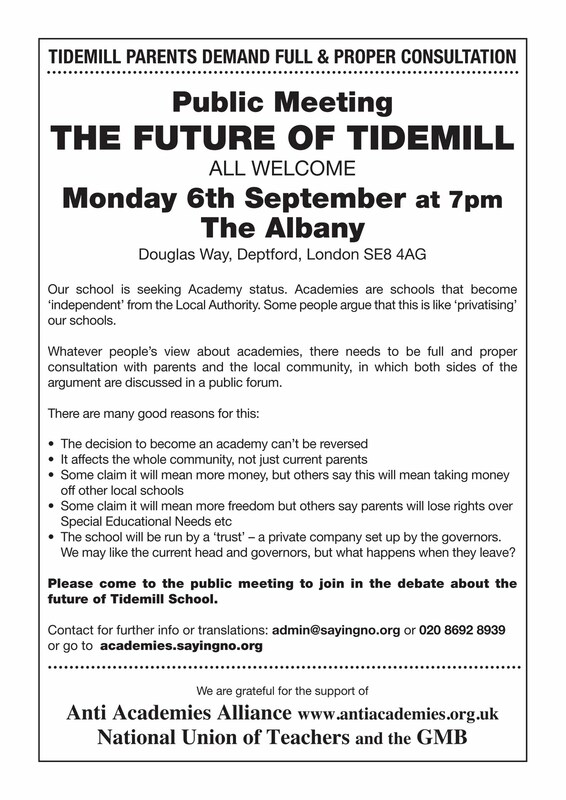 A PUBLIC MEETING HAS BEEN ORGANISED FOR MONDAY 6TH SEPTEMBER AT 7PM AT THE ALBANY, DOUGLAS WAY, SE8 4AG (see leaflet). 2. LEAFLETTING FOR THE MEETING will be taking place on WEDNESDAY SEPTEMBER 1st and SATURDAY 4th SEPTEMBER from MIDDAY in DEPTFORD MARKET. Please pass on this email to others who may be interested. Many apologies for calling the NUT the TUC (corrected as of 4pm, 31st August). By now - assuming you've got back from work - you should have found something looking a bit like this in your letter box. And over the next few weeks, as a sort of history of Crossfields, Marmoset is going to be uploading some back issues of the Crosstalk magazine from the 80s and 90s onto the new ''Backtalk'' page. It kicks off with a 1994 issue dedicated to Sue Godfrey of nature reserve fame. Many thanks to Emma who managed not only to store the back copies away but more importantly, succeeded at finding them again! 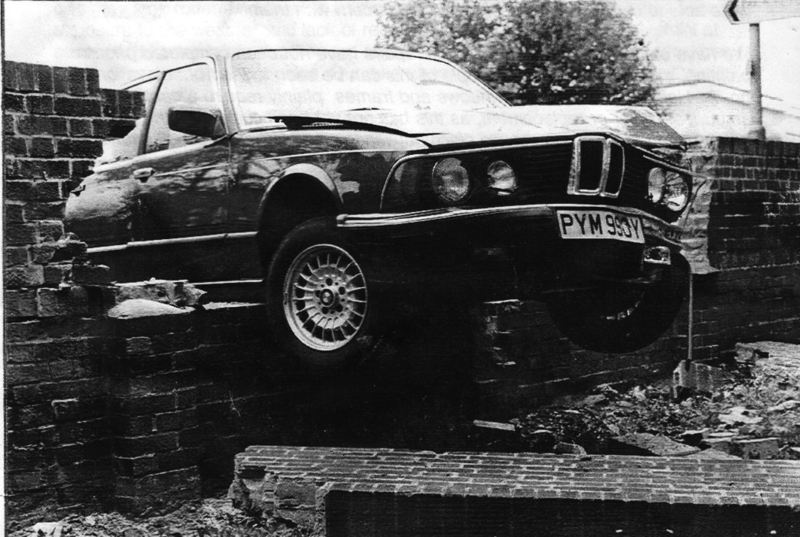 Back in 1992, a car came through the wall off Deptford Church Street. It made the front page of Crosstalk. Recently a similar accident occurred. As far as we know, no one was hurt in either crashes, but rubble from the fallen wall remains scattered in someone's allotment. "The repairs team have made the wall stable temporarily whilst an insurance claim is made to cover the damage. I have informed them of the rubble which remains which they will come and remove. I sent photos of the damage to the wire fence and they will forward this on with the claim." (UPDATE 25 Aug 2010) These 2 paintings were removed this morning. I did say get a look while they're still fresh but I didn't expect them to get painted over that quickly. What seems to have happened is this: a tagger came along and stuck a couple of fairly random sub-NVQ graffiti green splodges in neighbouring arches. The council anti-graffitil team, who don't seem to have a problem with Matlakas' work, do have a brief to remove graffiti and they can't really make aesthetic judgements about what is art and what is graffiti, so the whole lot had to go. So thank you, idiot with the green spraycan for wasting public money and getting artwork removed. A while ago this graffiti artist - real name Riccardo Attanasio - did some rather striking art on the arches on the Ha'penny Hatch. One conscientious citizen even called out the police while Matlakas was still at work, and yet he managed to convince them that it was art and the police went away content. Later, of course, someone came along and sprayed someone's phone number with lewd suggestions on a neighbouring arch and the anti-graffiti team painted over the whole lot. Well, these two have just reappeared. Best to get a look while they're still fresh. Ok, record stuck in a groove time again.... I have this theory that Deptford is going to disappear. Already, Greenwich SE8 has become a westward-drifting reality and there's also a gradual expansion of Brockley from the south (Deptford cemetery is now Brockley cemetery, Deptford Common is now Hilly Fields). And today, quite by chance, I wanted to get a streetview image of somewhere in Deptford. 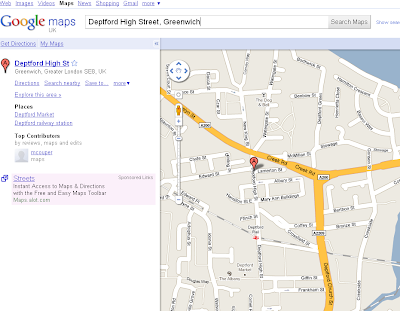 I started typing in Deptford High Street but before I'd got half of it done Google auto-completed the address for me. 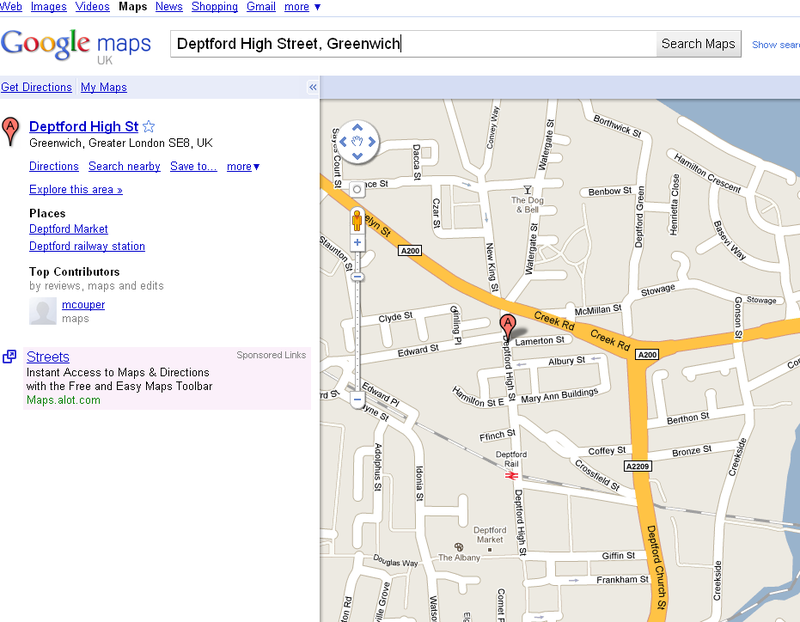 Yes, Deptford, according to Google, is now in Greenwich! If you see a red butterfly flying in Deptford and it lands on the ground and vanishes you may just have seen a Jersey Tiger moth. 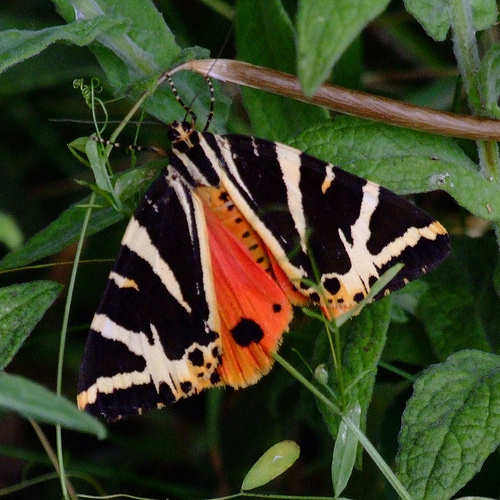 Look closely and you may see the forewings which have a chocolate background and cream stripes. The vivid red hind wings are hidden beneath. They were restricted in Britain to Jersey and the south coast but suddenly turned up in Forest Hill about 5 years ago and have spread since. They were first seen in Deptford on a barge 3 years ago and there have been several sightings of them this year already. 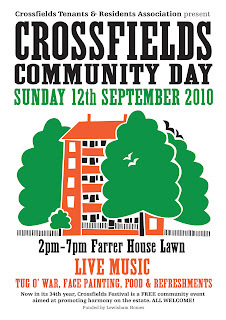 On Crossfields they have been seen literally on Congers House and in the play area opposite the Creekside Centre. 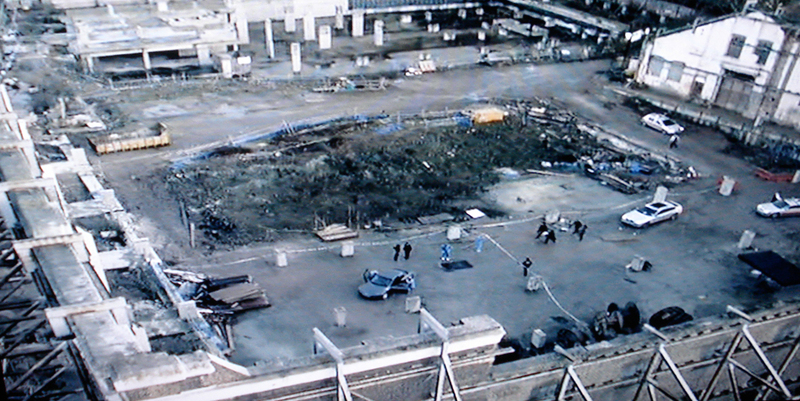 ...or rather welcome to what's been happening on the Job Centre site. 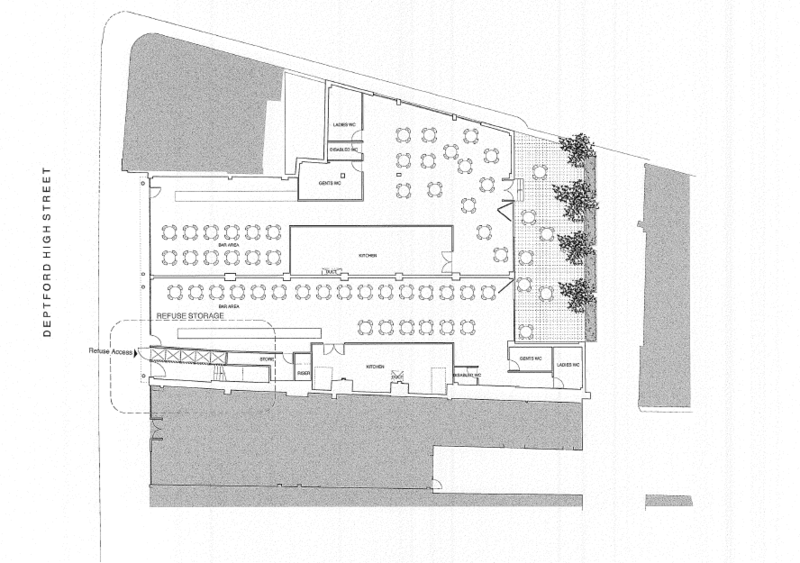 This is an architect's impression of how the site will look - two restaurant-type sites on the ground floor and a number of live/work spaces built up to 2 storeys above. Permission for this went through over a year ago in June 2009. It appears that there was an initial planning application way back in November 2003, and the planning committee (B) was clearly taken with the idea of how it would improve the look of the area for people emerging from Deptford Station. 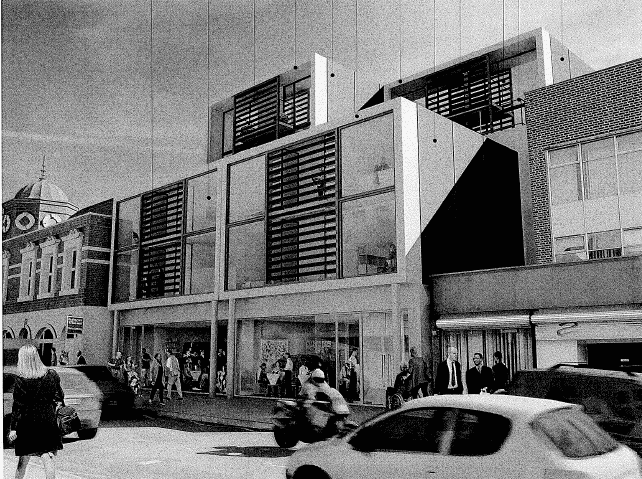 I quote: ''The choice of materials and the detailing referred to in the accompanying material should result in a striking new addition in an important part of Deptford High Street, due to its position in relation to the station and the proposals on the other side of the road''. (Page 43, para 3.3 here) This continues in the next paragraph, 3.4 with ''Moreover, the added height of the development would mean that it would add interest from the railway and act as an important marker for the High Street and or Deptford as a whole.'' Quite coincidentally, improving the appearance of Deptford High Street entails the removal of lots of unemployed people from the area. I didn't know anything at all about this when I spoke to my mole in the jobcentre today. Of course, I knew about the on-off nature of the closure and when I read ''Local MP secures promise on Job Centre'' on Joan Ruddock's website I knew that the game was up. Because the only ministerial undertaking to keep a full jobcentre service in Deptford was if a suitable building could be found. So I asked when the closure was expected to happen. Some staff are already being relocated but the lease runs out in November. And I learned something interesting while I was at it. According to the mole, when the last government gave the ok to renew the lease, the job centre management kept on adding, adding, adding to the expansion upstairs taking the cost up to several million pounds. Yet under the last government there was never a budget for this empire building. However, they have a convenient scapegoat now that they're now longer in power. And another snippet, that I can neither confirm nor deny, was that it was the then Deputy Mayor for Labour, Heidi Alexander, who signed off the change of use to hot food and drinks. I don't know whether this is true, but I do know that when the application was finally agreed Mrs Alexander had responsibility for Regeneration, which includes the environment, waste management and economic development. One thing that it is really hard not to be cynical about though, is how Joan Ruddock could use her ''success'' at staving off the jobcentre closure as part of her achievements as MP for Lewisham Deptford when the woman who's now her neighbouring MP in Lewisham East had been the deputy mayor for Lewisham at the time that new use and development was being discussed. At to make it odder, Heidi Alexander used to be Joan Ruddock's researcher. So they're neighbouring Labour MPs, they necessarily had a close working relationship, and Alexander was in power when the plans went through. And yet Ruddock claimed she'd saved it. I find I can't quite believe that she can't have known that it was already a done deal. The Community Improvement Competitive Fund is open and you've still got time to submit your application. You can apply for funding for up to £5000 to fund improvements in your local area. • Safety in your area. It could be a project to improve a communal space, buy equipment for community activities or continue a community group that works in the area for the community. These are just a few suggestions but we'd love to hear your ideas. You can apply as part of your TRA or submit an individual application. There's more information on the Community Improvement link above. Bids have to be submitted by 27 August with awards to be decided shortly afterwards. It's not for anything needing major works or planning position but if you've got an idea for something that might help the community, here's a link to the application form and guidance notes. If you have an idea but have no idea how to put a bid together, the link above will point you to a workshop at Honor Oak Housing Office on Saturday, 21 August. 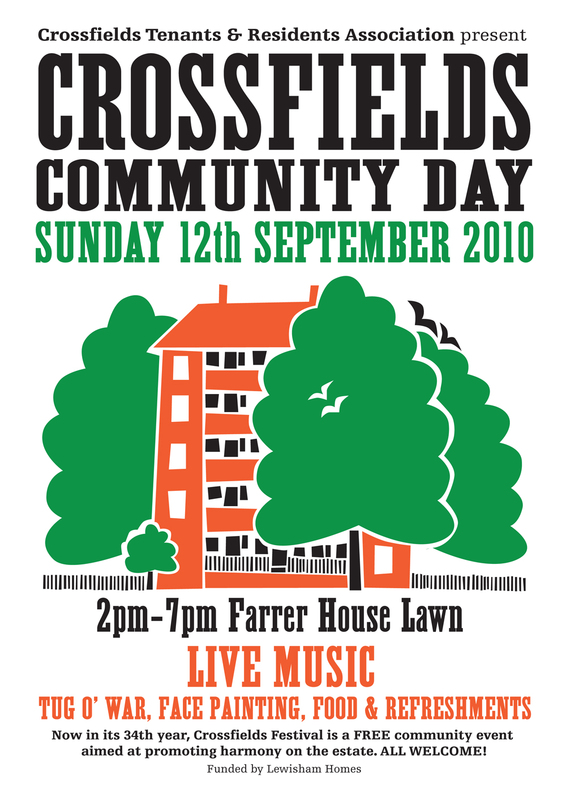 There's an estate inspection of the south side of Crossfields on Thursday 19 August at 4pm. You'll have seen the notices taped to our dilapidated noticeboards. Meeting point is 1-20 Holden House (Creekside). 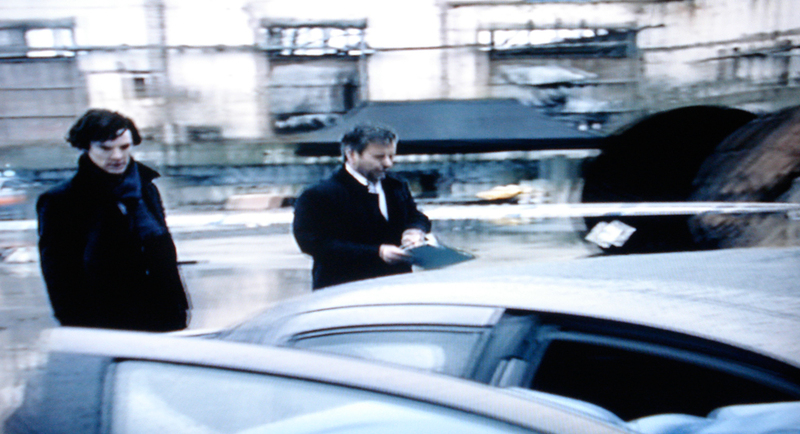 During the inspection, the inspectors examine communal (shared) areas. The tour looks at the standard of cleanliness, communal repairs and environmental issues. If you are unable to attend and/or have any comments to make, please contact the Quality Team on 020 8613 4760. Or leave a comment here and we'll try and make sure Ruth Hindle (our Quality Officer) gets it. The inspection was attended by myself and our Allotments Rep, Ruth, who wanted to draw Quality Inspector Ruth Hindle's (yes, we had two Ruths!) 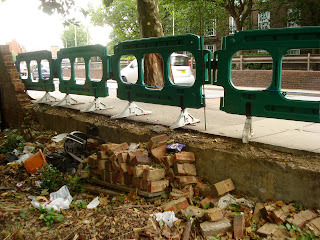 attention to the broken down wall that borders the allotments next to Cremer, and Deptford Church Street. Then we left Ruth H to get on with it inspecting the communal areas. 3. I have emailed the manager regarding the bulk waste removal regarding information of scheduled pick ups and also sweeping responsibilities and schedules. I will let you know when I get feedback. 4. The notice boards, I have been informed are mainly old boards installed prior to Lewisham Homes' and so we don't have keys to access these. I have therefore, following your recommendation asked for these to be removed. 5. Regarding untidy tenants and issues with items on stairwells I have been informed that there is a project planned for the whole estate to work with residents to clear these items from communal walkways. The tenancy enforcement team will be liaising with yourselves (i.e. TRA) and community involvement to work together to assist residents in removing items from these areas. This project will commence before the end of the year and the team involved will be in contact with you prior to this to get your views and assistance in implementing this clean up project. I have spoken to Ruth Blake regarding the issues with the wall. The repairs team have made the wall stable temporarily whilst an insurance claim is made to cover the damage. I have informed them of the rubble which remains which they will come and remove this. I sent photos the damage to the wire fence and they will forward this on with the claim. I have, after speaking to Ruth, given her details to the repairs team in case more information is required. I must say, Ruth Hindle is receptive and efficient and a vast improvement on the previous incumbent. I'm not sure, however, that fly spray is going to solve the fly problem created by uncleaned paladins (the bins), bin chambers, and dirty chutes, but hey. I'm astonished the recommendation has been taken up to remove the noticeboards, but I agree that they are a wasted resource and make the place look even more scruffy than it already does. (I even referred to them as dilapidated earlier in this post, so it wasn't difficult to pass on Anon's comment). One would hope that any remedies for untidiness caused by some residents that are proposed by Tenancy Enforcement will not result in insulting those residents who take pride in their surroundings – if there is the promised consultation. It is not just tenants either. Consultation may help to ensure there is not the rather fascistic clearing of balconies as was proposed the last time, as referred to by Anonymous. Here is Ruth's general report, which relates to communal areas (the above being in addition to this). It doesn't include Anon's particular references to Holden House I'm afraid. I was probably too late in referring the comments. Also, despite Ruth's noting of dirtiness everywhere, scores are still mostly in the 90s (out of 100), which just goes to show the poor standards set by Lewisham Homes (that Ruth must adhere to). Download Ruth's official report here. Quite by coincidence, just before posting up the ''Naming and Praising'' thread, an email arrived chez Crosswhatfields from san, in which he praised the staff in the Halifax for their being ''unusually helpful and friendly'' in what is a busy branch. I had a quick look online to see whether I could pick up some background on the closures. The Daily Mail published a mole's revelation back in September, 2009, that Lloyds was planning a major cull of Halifax Branches. LloydsTSB immediately leapt into denial mode. I don't remember this happening very often but the Mail appears to have got this bit of news spot on. If there's a branch in the same street as a Lloyds TSB one of them will close eventually, and unless the Lloyds branch is in a much worse location/condition, it'll be the Halifax which will close. In other locations they'll probably change name. But your account will continue as usual. And yet there is no LloydsTSB in Deptford at all so it's not a question of them having 2 branches in the area. The nearest LloydsTSB branch is in Greenwich town centre and they're rarely helpful or friendly there. No, it appears that they're simply quitting the area. So much for the ''community'' part of their name. So when the public bailed out Lloyds, it was for Lloyds to return to profitability and shut down Halifax branches. So the winners of the Best national branch network 2010 get rewarded with redundancy. The award was sponsored by yourmoney.com apparently. Right, now which bookies feel they're missing out on having an outlet in the High Street...? Well definitely her! You mean the dark haired one who is always so cheerful? And I love the staff in Kim's. But the Girl in Greggs should have songs written about her! So please, if you can think of any others who deserve a little more recognition, or merit having songs written about them, feel free to make sure we all know who*, or where they are. *Pedants, of course, might point out that she hasn't been named here, but if you didn't know where she was, you do now. It seems a long time since the elections. 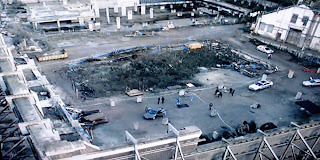 That's around the time I asked Joan Ruddock at the Utrophia hustings what was happening with Deptford station. It's also around the time that the Dame posted about a new developer's contract. Anyway, Joan said it would all be going ahead in the summer. "Joan is currently out of the office at the moment, however she chaired a roundtable meeting a few weeks ago which included Network Rail and the Council. At the meeting we were told that Network Rail were in the very final stages of signing everything off, the contractor had been appointed by the council and some preliminary work had been undertaken. The main, more noticeable work should begin in the first week of October. I hope that this information is of assistance to you." See the Dame's May 27th post here. If anyone's got some more detailed news, please let us know. A very interesting email arrived in the crosswhatfields email inbox this morning. Paragraph by paragraph, this is what it said. 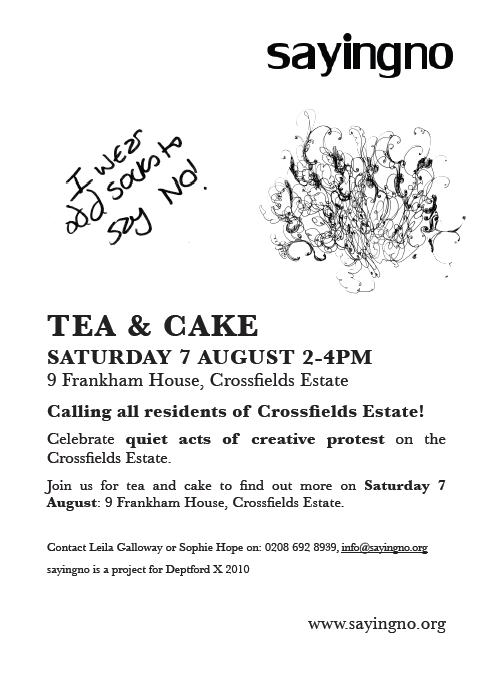 Who runs the crosswhatfields website and is it displayed anywhere on the website? I have a feeling I have totally overlooked it and it must be somewhere obvious. Author's profiles are listed in the lefthand column at the foot of the page, and in some cases will lead to other blogs. As with most blogs, it is up to the individual author how much information about themselves they display in their profiles. For instance, does anyone know the real identity of local blog favourites Deptford Dame or the Greenwich Phantom? Not knowing the real people behind the pseudonyms does not make their blogs any the less interesting or relevant. On the other hand, when blogs do give real identities, it is very often when they are ''celebrities'' or politicians or journalists - people who use blogs for professional reasons. And we certainly aren't getting paid. If not, don't you think it's a maverick operation with potential danger to individuals? I notice the 'wall of shame' for example which targets a particular individual. You can't undertake things like this if people cannot make you responsible for what you post. Why is there no endorsement from an official body on the website? Who is it that says it should be there? If the webmasters (this benevolent team of evanescent 'volunteers' we hear about) cannot be identified what do we do if we need to sue them? We make it clear the opinions expressed are not those of any official body – as befits a free press, opinions are often not those of the editor or the producer/proprietor. See above. Also, anyone is welcome to comment, disagree and debate. 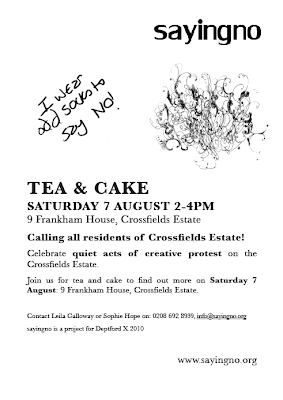 It may be that, having used blogger.com's free service as a kind of forum for Crossfields life, the blog may have some slight influence on the tenants' and residents' association - if that's the case, it's the comments from the residents themselves that add weight. I am not intending to sue you - indeed I think you do valuable things and it seems as if the influence of a residential committee is refocused and made dynamic through the website. But I should like to know who I am dealing with when I read it. Thank you. The TRA do not contribute directly to the blog. Anyone is welcome to become an author on the blog – again, it is up to them whether they identify themselves clearly. The names and contact details of elected representatives, from MPs to block representatives for the TRA are given on the ''useful information'' page if you need to contact ''names.'' This is simply an additional place for contributing and that place is in the strange demi-monde of blogging where identities remain blurred. Anonymity is both a blessing and a curse - it can encourage more honest expression (good) and it can result in people dismissing comments because they haven't put their name and address to it (bad). In the end, you have to treat us a bit like the Deptford Dame, Brockley Central or the Greenwich Phantom - relevance and integrity is not assured by identity but by a demonstrable commitment to local issues. Which is not to say you have to agree with every word or argument - there's a comments box for disagreeing and an off switch on your computer. Please do give me a good answer - I'm sure it's organised through the residential committee or some such thing and they would answer the same? See above. Those on the TRA committee have been offered authorial rights but (with one exception) have not used them, nor have they ever commented in their official capacity. Hopefully, however, they welcome the blog as a useful communication tool, since it is difficult to attract people to monthly meetings. But contact the TRA and ask them if you're in doubt - personally I'd be surprised if they gave you the same answers. By the way, I think it's a very good website. Thanks, a bit of positive feedback always helps. In response to a possible anticipated question: No, I don't feel I have to tell you who I am. Your website purports to represent the interests of individuals in a community and unless I am very much mistaken you don't feel like telling me who you are. Bit of a Catch 22, that one. I'll show you mine if you'll me yours... It's not an official website, it's a blog, and it doesn't purport to represent anything other than the views of its authors who happen to be part of the community. If you look at the comments box you'll find we say that we prefer comments not to be made anonymously - because as soon as there are 2 anons commenting on a post, it gets hard to tell them apart. We simply express a preference for a pseudonym if the poster doesn't want to give a name. On the whole, we believe the views of blog contributors are benevolent to the community's interests. However, many of the resident's views are not represented since they choose not to use the blog to express them. It is possible to have up to 100 authors, but for various reasons (lack of web access, lack of confidence in their writing skills), people have chosen not to take up this offer. Now, by now you will have realised that we're not going to ask you who you are but, instead, we're going to take it on trust that you're local and interested - why else would you take the time and trouble to write? 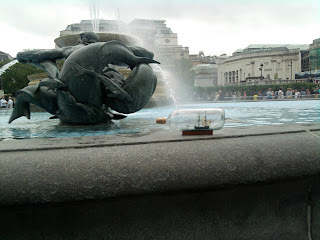 If you wish to publish a post on the blog, you're very very welcome. Simply let us know and we'll send out an invitation to you to author your own posts. However, it won't make you an ''official representative'' of the TRA or anything like that. I think someone has to vote you in for that. A couple of photos found their way into my inbox yesterday. They came from Simon Cowderoy, long-time Crossfields resident who currently resides at a latitude several seconds west of the estate. 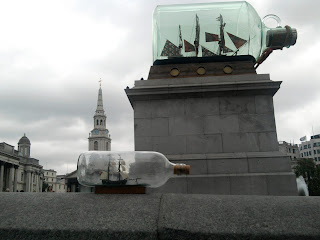 I thought there was something typically ''Deptford'' about them - humour and maritime history encapsulated. From a £2 ship in a bottle bought in the market to the 4th plinth in Trafalgar Square, they made me smile anyway. The Sirens of Titan in Oxleas Wood. I've not been to one of these Bubble Theatre in the park performances but judging by the Greenwich Phantom's glowing reviews they come highly recommended. What will summer in Oxleas Woods look like the next few days? For a start, it will be a time-travelling journey from Mars to Mercury and Titan via Earth. Very different from the heroic, epic voyage that Odysseus made last year! It will also include an experience of chrono synclastic infundibulum - where there are many different ways to be absolutely right about everything. you will learn about the futuristic art of surviving without oxygen, using Goofballs! If all that sounds unfamiliar don’t worry, we haven’t completely flown out of this planet. It will be another great Bubble show – full of moments of excitement and surprise and songs and dance! This year it’s The Sirens of Titan! The performances begin at 7:30pm tonight and run over the weekend before decamping to Deptford Common* next weekend. 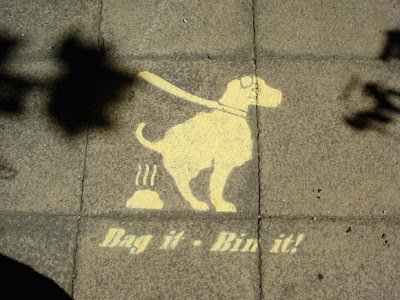 Bag it Bin it - but where? In the time old tradition of useless signage (see Bikepest's post in June on Estate Signage), we now have the doggy poo sign that appeared last week – in this case, two on the path besides the common grass by Frankham and the roundabout. 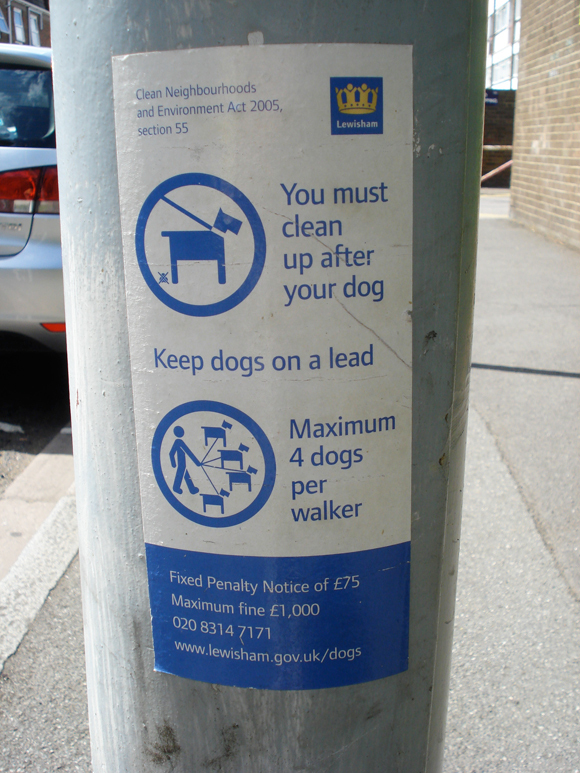 Nothing wrong with asking people to pick up after their dogs, of course, but what do they do with the bag of poo? Where are the bins to dispose of it? A Frankham resident was told she could not use the block bin chambers – so where can she put it? 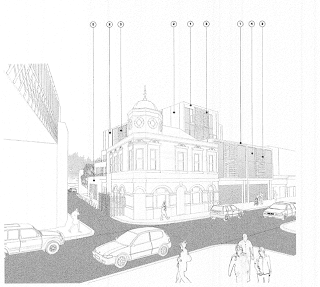 Latest suggestion – the steps of the town hall. Has anyone ever been fined or heard of someone being fined for these misdemeanours? There are areas on the estate that are clearly signed "No dogs" which many people take no notice of since there is no one to enforce the rules. Signs like these are no more than Polite Notices despite the threat of rather large fines. I do like the doggy poo one though...just a shame a good idea is not backed up with some sort of disposal unit that makes the Bag It, Bin It instruction easy to follow up. 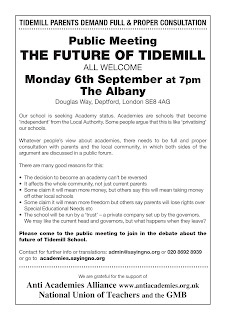 It seems like the uncertainty surrounding the proposed change of Tidemill from an ''outstanding'' school to an academy is proving to be the source of a lot of concern. It's new legislation, rushed through parliament just before elected government goes on holiday, complicated by the media stories about Mark Elms, Tidemill headteacher, creaming off millions and millions of...ok, I'm exaggerating...rather a lot of money from the public purse. But at heart, it's about knowing what's going on, what's being proposed, which power group is pushing what where, and how it will affect Deptford and our schoolchildren's education. It seems only sensible to try and find out what is going on. And finding out what is going on needs some consultation. Which is why there will be a stall somewhere in Deptford market tomorrow (maybe more precise details will arrive in the comments box) where you can sign a petition, which is nothing more than a simple demand for consultation. It's not a knee-jerk ''no, don't change anything'' reaction, more of a ''could you ask us what we think and tell us what you're doing?'' kind of thing. You know, the kind of thing - democracy, I think it's called. Double-click if you need to expandificate it - or go here to download the PDF and have a look at the sayingno.org site.